White ceramic braces are made of ceramic and placed on the outer surface of teeth. They work much like metal braces but are less visible. A white coloured wire is also used instead of a grey wire, making the brace even less visible. Lingual braces are hand-made in Germany (much like that of how a sports car is made). They are customised to fit your specified tooth structure and are usually made either of silver or gold. The braces are fitted on the inside of the teeth so they are pretty much invisible. Dr Stefan Abela is one of the few specialists in the country who has a wealth of knowledge and education in lingual braces. He teaches lingual braces to specialist students. Invisalign is one of the most modern types of invisible braces. Using revolutionary digital technology your teeth are first scanned Each individual tooth is then moved by an orthodontic technician on a computer screen. Once your final smile has been designed you can see how you look with Invisalign’s remarkable 3D visualisation tool Clincheck©. 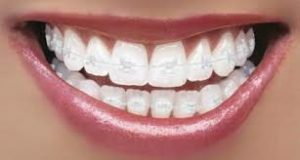 By initially creating a digital mould of your mouth, clear braces are then made from plastic, you wear each of these clear braces for approximately 2 weeks and then change them at regular intervals as your teeth move closer to the ideal location. Due to the clear nature of the braces and the fact that they can be removed for eating or occasions where they may prove to be an annoyance, Invisalign are a popular choice for teeth straightening amongst adults. Dr Stefan Abela is an invisalign gold member due to his wealth of knowledge and experience in the system. The cost of clear braces is generally a little more than conventional metal train track braces. Your specialist consultation will include a thorough discussion of your treatment options, fees and time. All prices are included in our price list. Contact our Newnham orthodontic practice today to book a consultation with Dr Stefan. I had invisalign treatment for 18 months and the result is exactly as promised at the outset. Dr Stefan took great care to ensure that I received a straight smile , the staff were really helpful and accommodating throughout. Highly recommend! On behalf of my wife - all round thoroughly excellent care. So kind and helpful. She's just sorry she didn't find this practice years ago. Dr Milisha is both skilled and experienced in dental implant work, highly recommend! We take all steps to ensure that we understand your wishes, expectations and requirements. No one patient will receive the same treatment plan as the treatment times and materials are catered to suit your individual needs. Read more.